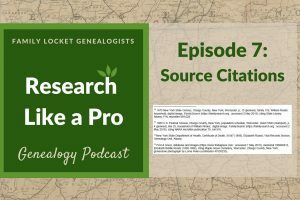 In our podcast episode today, I’m discussing my research project to discover the parents of Lucinda Keaton of Pendleton, Anderson County, South Carolina. 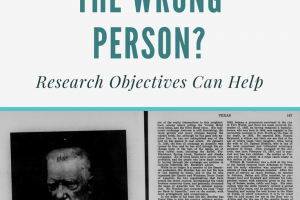 Diana and I will review what I knew when I started the project, how I found clues leading to a hypothesis that her father was William Keaton of Pendleton District, South Carolina, and what records I searched to prove the hypothesis. We’ll discuss each step in the research like a pro process, including my timeline analysis, locality guide, research plan, and so forth. The locality guide portion of my project was important, since the location I was dealing with changed names several times. The town of Pendleton was part of Pendleton County, then Pendleton District, then Anderson County. You’ll hear all about how the research like a pro process was successfully applied to my research problem and what the results were. 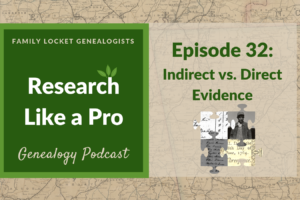 All the work samples associated with this project are available to those who purchase our book, Research Like a Pro: A Genealogist’s Guide in our online work samples page. If you are interested in learning more about the Research Like a Pro Study Group and signing up for our email list with updates about it, click here.